Hoards of unruly people can be more easily controlled with our custom powdercoat temporary crowd control barriers. Sometimes, the standard option just isn’t enough, and you might need to customise your crowd barriers to better cater to your event. For instance, you might wish to customise your crowd control barriers to match the colours of a corporate theme. 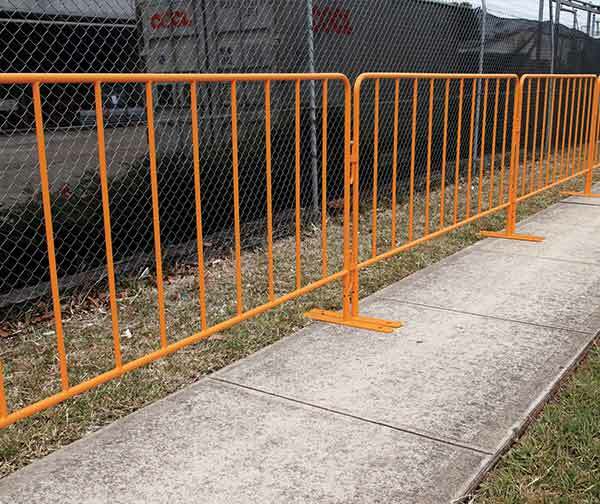 All custom powdercoat crowd control barriers are of the same high quality as our standard galvanised steel crowd barriers. Panels can stand alone or interlock with each other to form longer barriers. Each individual barrier features feet with a profile so low that chances of people tripping over them are greatly minimised. Feet can be completely removed to make transportation and storage a breeze. We believe crowd control barriers need to be not only sturdy and safe but also easy to use, install and store. That’s why we’ve designed our crowd control barriers to be easily nested together for storage purposes. Whether you’re using them at a rock concert or a marathon, our custom powdercoat crowd control barriers will keep the crowds at bay while sending out a strong message about your corporate identity.